Since Setting-up this website in November of 2005, I've recieved lots of e-mails from people interested in the Quickie design. I do not claim to posses the ultimate and final answers to anyone's questions, so I respect and rely upon the experience and knowledge of other builders and enthusiasts to help me out. As always, especially in experimental aviation, the buyer/builder has the final say as to the safety of any answer given. Therefore always remember that your mileage may vary. I encourage everyone to ask questions in the forums, so that others with more experience can weigh in on the discussion and provide insites that I may not currently be privy to. Q: Can I build a Single Seat Quickie from scratch using the plans and templates you have for sale on this site? A: The short answer is MAYBE. Here's the long answer - Basically it depends on how resourceful you are, and how confident you are in your ability to fabricate components that are no longer manufactured. Here is some background: The Quickie kits were manufactured and distributed by Quickie Aircraft Corporation (QAC) throughout the 1970's and early 1980's. Because of several factors they went out of business in 1986 and declared bankruptcy. The plans that they provided, and the plans that are available for sale on my site, were to build the Quckie from one of their kits. Therefore, the plans are missing some information about how to fabricate several parts that were supplied by QAC. However, I feel pretty confident that a resourceful builder, could fabricate a single seat Quickie from scratch. The majority of parts for the airframe are constructed by the homebuilder, and those parts are fully documented in the plans that QAC provided. Q: Why are there two sets of templates for the canard? 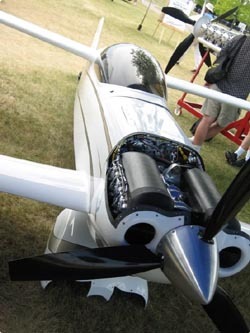 A: Early kits used a different airfoil, than the later kits. The original Quickie had a GU airfoil canard. This airfoil was prone to lose lift when contaminated with bugs (or rain). This required significant increase in control stick back pressure to maintain level flight. (Many builders found this very disconcerting!) The contamination issue seemed to be resolved by the installation of vortex generators on the GU canard. The LS1 canard solved the contamination issue, but it requires a carbon fiber spar, which an Australian enthusiast named Peter Harris is producing again in limited quantities.